IP Result of anti-TIA1 (IP:12133-2-AP, 4ug; Detection:12133-2-AP 1:500) with Jurkat cells lysate 3200ug. 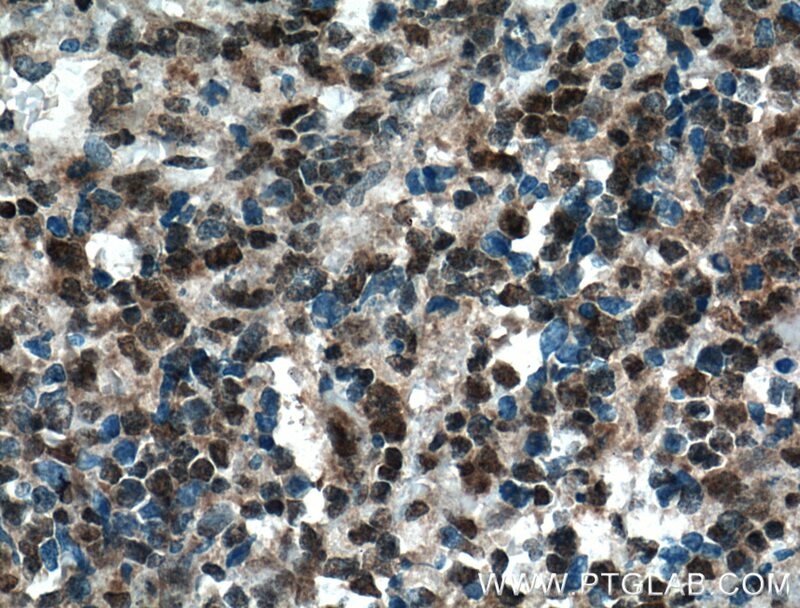 Immunohistochemical analysis of paraffin-embedded human lymphoma tissue slide using 12133-2-AP( TIA1 Antibody) at dilution of 1:200 (under 40x lens). heat mediated antigen retrieved with Tris-EDTA buffer(pH9). TIA1, also named as p40-TIA-1, is involved in alternative pre-RNA splicing and regulation of mRNA translation by binding to AU-rich elements (AREs) located in mRNA 3' untranslated regions (3' UTRs). It possesses nucleolytic activity against cytotoxic lymphocyte target cells. 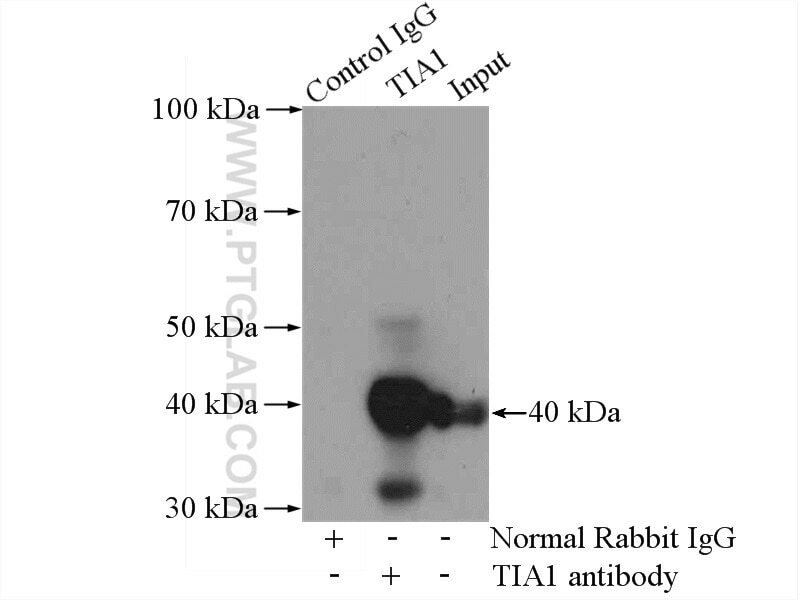 TIA1 may be involved in apoptosis. Two isoforms of this protein exist - 41kDa and 42kDa. one of these was a missense variant (P362L) in TIA1. Similar to the ALS-related disease proteins TDP-43, hnRNPA1, and FUS, TIA1 is an RNA-binding protein containing a prionlike LCD and assembles into membrane-less organelles, including SGs. Postmortem neuropathology of five TIA1mutations carriers showed a consistent pathological signature with numerous round, hyaline, TAR DNA-binding protein 43 (TDP-43)-positive inclusions.TIA1mutations significantly increased the propensity of TIA1 protein to undergo phase transition. In live cells,TIA1mutations delayed stress granule (SG) disassembly and promoted the accumulation of non-dynamic SGs that harbored TDP-43. Moreover, TDP-43 in SGs became less mobile and insoluble. We found acetone fixation (20 min in 100% acetone at -20C) worked better than paraformaldehyde. HuR and TIA1/TIAL1 Are Involved in Regulation of Alternative Splicing of SIRT1 Pre-mRNA. Targeted Knockdown of RNA-Binding Protein TIAR for Promoting Self-Renewal and Attenuating Differentiation of Mouse Embryonic Stem Cells. SAMHD1 Inhibits LINE-1 Retrotransposition by Promoting Stress Granule Formation. Alternative splicing of U2AF1 reveals a shared repression mechanism for duplicated exons. Clinical and neuropathological features of ALS/FTD with TIA1 mutations. 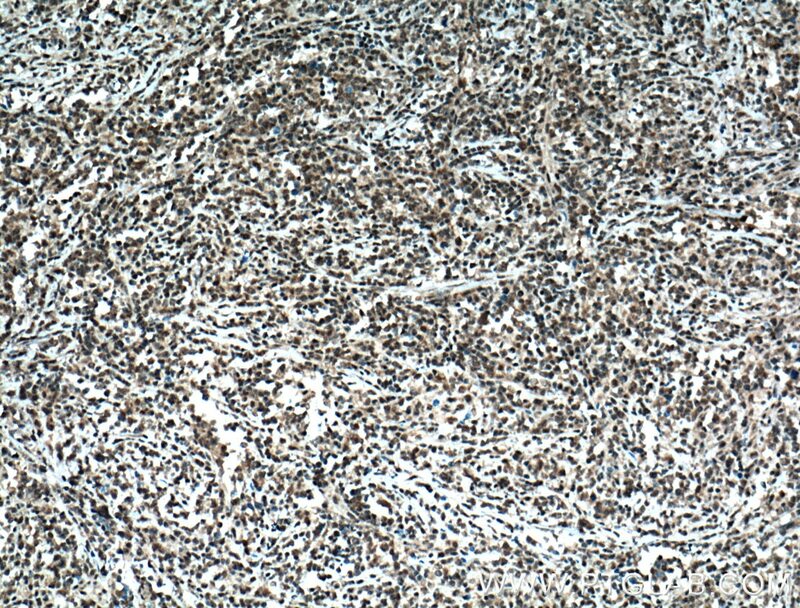 Immunohistochemical analysis of paraffin-embedded human lymphoma tissue slide using 12133-2-AP( TIA1 Antibody) at dilution of 1:200 (under 10x lens). heat mediated antigen retrieved with Tris-EDTA buffer(pH9).